As Nate gets older, I find myself entering familiar territory from my own childhood now and again. 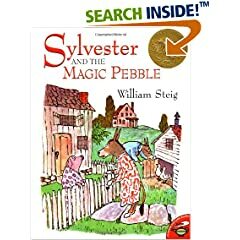 So I had one of these nostalgic moments recently when Nate pulled Sylvester and the Magic Pebble out from his bookshelf. One of my close friends from college had given us “10 great books from childhood” at my baby shower back when I was pregnant the first time. This was one of them and I hadn’t read it in years. Do you guys remember this one? It’s a creative story with a happy ending and was very enjoyable for the 4-year old in our house. They have it on Amazon.